Each player starts with the same small deck of cards that consist of proton, neutron, and electron cards. 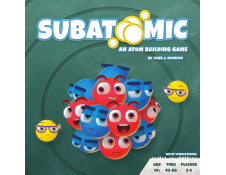 They use these cards to build upon their current atom (by playing these cards face-up as subatomic particles) in an attempt to construct one of the available element cards. Alternatively, players may use their hand of cards to purchase more powerful cards for later use (by playing them in combinations of face-down cards as energy and face-up cards as subatomic particles). 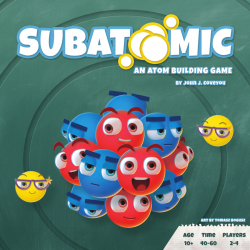 Subatomic introduces a unique variation on deck-building with a highly accurate chemistry theme, with the ultimate goal of building elements to score points, but allowing many varying types of strategies. 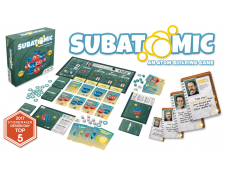 Făcând parte dintr-o echipă de experţi ce luptă împotriva bolilor, trebuie sa ţineţi sub..
Plague Inc: The Board Game is a strategic game of infection, evolution and extinction for 1-5* ..
O nouă eră se ridică la orizont. Viitorul Noriei se află chiar în fața ta și trebuie să î..